An ATLAS candidate event for the Higgs boson particle decaying into two bottom quarks. Physicists at CERN recently observed this process, which further confirms the Standard Model of particle physics. Higgs boson particles don't live very long. "You'll never hold a Higgs boson in your hand," James Beacham, an experimental high-energy particle physicist working with the ATLAS collaboration at the Large Hadron Collider (LHC) at CERN (the European Organization for Nuclear Research) in Switzerland, said to Space.com. But, although the Standard Model predicts what happens to the Higgs boson when it dies, until now, researchers hadn't observed the particle decay into b quarks, Beacham said. Although observing the Higgs boson decay might not garner as much attention as the discovery of the particle itself, which was awarded the 2013 Nobel Prize in physics, it is a colossal victory, the researchers said. But the work didn't come easily. To create b quarks, physicists essentially smash protons together. A lot of background "noise" results from this process, and b quarks "are almost impossible to tease out from background" "fuzz," or sprays of lighter particles known as jets, Beacham said. Additionally, ATLAS and CMS are separate detectors, so the collaborations working on each one must make and confirm these observations separately for it to "count." The ATLAS experiment at the Large Hadron Collider. 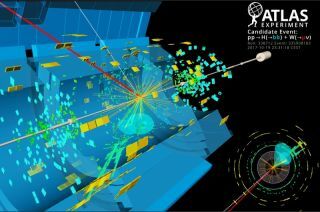 Physicists with the ATLAS and CMS collaborations at CERN have, six years after discovering the Higgs boson particle, observed the Higgs boson decaying into bottom quarks. The findings are another big step along the journey to better understand the Higgs boson and our universe. And each new discovery or observation, like the discovery of the Higgs boson, has the potential to give way to new questions and experiments. "First [you] discover the thing," Beacham said about the Higgs boson. "Then, you want to measure everything about it." Additionally, this work represents "a significant landmark in our tests of the Standard Model," Shelton said. "The Higgs' main job in the Standard Model is to give masses to the matter fermions and the weak force carriers," Shelton continued, "observing this decay, then, is our first direct piece of evidence that the Higgs boson gives masses to [down-type] quarks as the Standard Model predicts. Observing this decay mode also leaves less room for potential undiscovered particles to contribute to fermion masses." In confirming that this particle does, in fact, decay into b quarks, these physicists have shown that the Higgs field, the field behind Higgs boson particles described by Beacham as the "invisible jelly that permeates all of space," gives b quarks mass. The Higgs field uses the Higgs boson to interact with other particles, like the b quark, and give them mass. Experiments like these allow physicists to not only validate what the Standard Model predicts about the Higgs boson and b quarks but also challenge what the Standard Model predicts. "So far, the Standard Model is continually winning," Beacham said. "[But] if we find evidence that it's not so standard," Beacham continued — if we find things like "extra quarks, weirdo things like vector-like quarks, leptoquarks, dark matter" — then we might also find a totally new understanding of how our universe works.